One of the most elegant elements of Dropfleet is the signature / scan rules. As a wargamer, I do not have a broad experience with a lot of different games (having focused mostly on a few GW games in the past), but I have not seen anything similar to this before. This is some of the core of what makes Dropfleet challenging and interesting to play. It does, however, also sometimes makes your scratch your head a bit. Echo Corvette with no spikes. Even though the Corvettes are closests to the enemy, they are almost the ones that is hardest to target. The Battle cruiser – despite being a big ship and all – is protected by its lack of energy spike and being somewhat further back, being the hardest one to target at all (all the harpies in the center of the picture have just performed a round of very successfull fire at it, but they are also the only ones in range). The somewhat counter-intuitive element in this situation is the poor Calypso which – due to having had the task of performing a scanning order – is by far the most visible ship despite being far back and having a low “base” signature. But the major spike really lights it up and at first glance, that is easy to miss, thinking that it is out of range. This kind of situation happens all the time and the more I play, the more I get a feeling for it. However, it still happens more or less in every game, that I am surprised to find that I can actually fire at something almost on the other side of the board due to a major spike, and I think this is a nice illustration of such a situation (though I am in the receiving end of the fire this time). 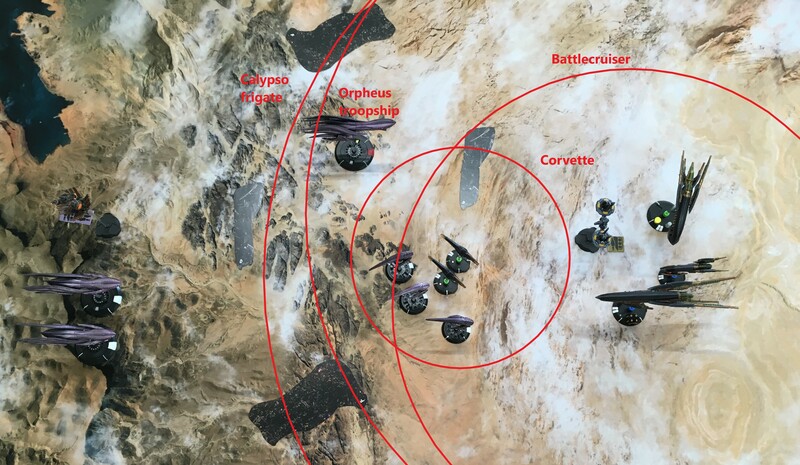 And to those who care about the fate of the vessels in the picture; by the end of the game, only the two corvettes (who are about to fly north and dive to atmosphere staying there for the rest of the game) and the Orpheus will survive – all other vessels present will have met their end over the next 3½ rounds.